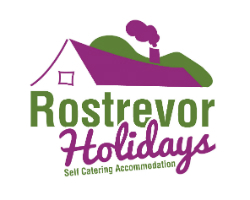 With 24 acres of peaceful farm surrounding the holiday cottages, along with a nature trail that runs through trees and alongside a river, you can enjoy a holiday with your dog from the moment you arrive at Rostrevor Holidays. Not forgetting three Forest Parks, the Mourne Mountains, and miles of coast all less than 20 minutes from the front of your holiday cottage door. There is something suitable for every dog, from the water loving to the high energy, and then for those that are in the golden years of their life, there is a choice of more relaxing walks. Visit our list ofplaces to visit with your dog for some ideas. At Rostrevor Holidays we recognise the importance of bringing your dog along on holidays with you, especially if you don’t want the guilt of leaving them locked up in a boarding kennel back home. So we’re happy for you to bring along your pet, and have made some of our holiday cottages dog friendly accommodation. Please read our Dog Rules, so that we continue to keep the high quality at Rostrevor Holidays along with being dog friendly. 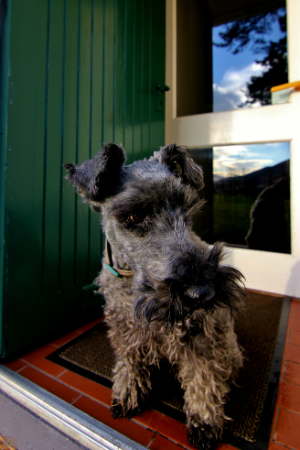 Dog Friendly Accommodation – which cottages are pet friendly? If you are looking to get away as a couple with your dog, why not book Leckan Beg or Crotlieve Cottage? Crotlieve, with the larger floor space is perfect for the bigger dog that likes to stretch out on the floor for a sleep after its walk. If you’re looking to book a family holiday with your pet,Cnoc Si 3 bedroom cottage is perfect with its tiled floors. Leckan Mor and The Ceili House are also Dog Friendly. Sorry, but the 5-Star Houses, Tievedockarragh, Slieve Martin, and Roosley, are all strictly no dogs accepted. How much does it cost and what are your dog limits? There is a charge of £15 per weekend, and £25 per week per dog. A maximum of 2 dogs are allowed per cottage. Need to get away for the day or want your dog to be pampered? Stephanie at Kilbroney Kennels, just 2 miles from the cottages, will take great care of your dog, from the provision of modern, heated kennels, to a grooming service. Please feel free to contact us if you have any queries regarding booking your pet friendly holiday.